Hello there my pretty little flowers! Do you see the picture up there? Do you?? YES! 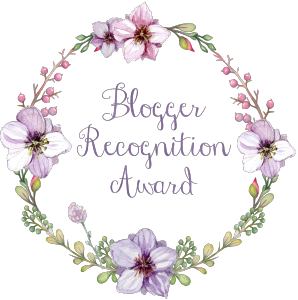 I got nominated for the Blogger Recognition Award by the lovely Sandee over at Aria Stuck In Wonderland! When she told me, I was so excited and happy because this is my first award since I’ve moved over to WordPress. So there are a couple of questions that come with being nominated and I’m going to answer them for you in this post. I started blogging last June mainly because I wanted a place where I could have a voice. Around most people (except family), I tend to lose my voice. I don’t talk much and when I do, my heart pounds and I start shaking sometimes. Saying things to people has always been difficult for me because I’m afraid that I might be judged or that I might say the wrong thing and look stupid. You might say that I have a form of social anxiety. So I have this wall up and I really don’t know when it came up but it did and I don’t exactly know how to get rid of now. All I know is that it prevents me from making friends. So my blog was a way for me to tell people everything that I bottled up. Which is why I’m always so honest and open in my posts. One of the best pieces of advice I ever received about blogging was to be yourself. The thing about blogging is that it’s hard to stand out. There are millions of blogs out there. How are you going to stand out? The answer is simple. Be you. Because there isn’t anyone else out there with the same thinking patterns of the same way of looking at something. People crave uniqueness. Let that special part that makes you you shine in your blog and you will attract an audiance. A lot of people expect instant success and fame with their blog. No. That’s not going to happen. Blogging requires consistency and a lot of time before you get anywhere. Keep working and you will see results. Don’t except to write two posts and then have companies emailing you for sponsorships and readers instantly sending you fan mail. That’s not how it works. It takes years. You may think that if you talk about certain topics or share popular opinions, that you will get a mass following. That’s not true. Like I mentioned, you need to be authentic, passionate and unique in your writing. For example, say that MAC just put out a new concealer and all the bloggers are raving about it. Don’t feel like you too have to go and write a post praising it if you personally didn’t like it or if worst, you aren’t even that interested in make up to begin with. Write about things that you are passionate about and express your opinions respectfully and honestly. There is no formula to blogging so don’t try to find or follow one. Once again, I’m so grateful to be nominated and I love all of you guys. See you soon with my August Wrap Up! Yay!! I’m so happy! This semester was so tiring and challenging and I couldn’t be more happy that it is finally over. I’m so done with going to school and feeling not so great about everything most of the time. I’m so much happier being at home where I don’t have to keep up any appearances and I can just chill out, read a lot of books and blog. So the idea for this post came to me about three days ago. If you don’t know, for the past two weeks, I have been studying non-stop for two exams. That meant that I was confined to one seat all day and I had to stare at a book and at my computer and try to get all the facts in. It was honestly horrific. I mean, I have ADHD. That means that sitting still and staring at a book just does not work for me. I learn by doing. Not by memorising. I honestly don’t know how I managed to study like this for 10 years before my polytechnic life. You may not get it if you don’t have a learning disability but my psychologist told me this. Most people have boxes in their head. Their brain knows where everything goes and it is able to sort things properly so that when you need to recall something, its right there. However, when you have ADHD, you don’t have these boxes. Everything gets thrown around everything is in a colossal mess. So when I try to think about one thing, my messy brain starts zooming off in a million directions and I struggle to stay focused. I struggle to quiet my crazy thinking pattern enough to listen properly and stay still to complete what I have to. Often the restless part gets better with age but your brain is just always going to be a mess. And there is absolutely nothing wrong about that. We just learn differently and progress differently. But there is NOTHING wrong about that. So I thought I would share a bit of what it was like studying for the last two weeks while giving you guys five tips to cope with studying for an exam if studying is just really not your thing. One of the things that really help me when I need to remember something is to write it down. So what I usually do is that I create my own notes. I use the lecture slides or even the notes that my teacher gives me and I rewrite them into a notebook. It doesn’t mater if you find yourself copying things word for word. The fact is that writing reinforces your knowledge so regardless, it’s pretty good. When you’re making your notes, you can also use acronyms or imagery to remember things. It’s a tip that has helped me for many years because I’m more of a visual person. So for example, if I want to remember something, I would usually create an image of it in my mind and store in in my little ‘mind palace’ (yes I learnt to do that from Sherlock. It’s a very very helpful thing that I’ve been working on for almost 2 years now. It is so helpful not just for memory work but also if you need a space to zone out or retreat when life gets too much. You should try it). I would then repeatedly recall it until it solidifies in my brain and I’m done. Memorised and ready to go! This is very important especially if you have a noisy mind like me. Music is great. It keeps you pumped when you’re studying and it often keeps you from going crazy when it gets too quiet. However, you need to know what music works for you. Personally, when I’m writing my notes, I can listen to anything from EDM to the softer folk/indie pop. These songs usually keep me writing fast and moving forward. However when I’m reviewing my notes or doing mock exam papers, I usually need to listen to instrumental music. But not just any instrumental. Music like Beethoven drives me absolutely crazy when I’m studying because my brain can’t associate it with anything. However, instrumental movie soundtracks like Hans Zimmer and James Horner or instrumental Disney music is fantastic for me because my brain has a memory to latch onto and I don’t go completely mental. And sometimes I need to know when to just turn off the music and focus in silence. Know what your brain needs. You will drive yourself crazy if you sit in one spot for hours on end. Especially if you are an ADHD kid. So take lots of physical and mental breaks. After you finish a chapter, stop. Take 15 minutes away from your desk, set a timer and do nothing. Or do whatever but just don’t be at your desk or think about work. Quite often, you will be tempted to deny yourself a break because in that one hour you spent sitting at your desk, you spent 30 minutes chasing your brain and begging it to settle down. So you don’t feel that you deserve a break. Take one anyway. You’re harming yourself more by denying yourself that time to rest your brain. This is something that I am still working on. I’m talking about asking for help from friends and teachers as well as getting help from medication. I have been on Concerta (the big sister to Ritalin) since I was 12. I hated it. I hated the side effects (If you have never been on pills that target your brain, you will never understand how a pill like this can rob you of who you are and how it can make you feel like a puppet) and I never wanted to take it. But despite the fact that it took a large chunk away from me (appetite, sleep, my cheery personality and more), it did help my brain to calm down and focus enough to study. I used to take it on a daily basis in sec 4 but I limited it to exam time only when it came to poly because I didn’t need it for projects. During this exam season, I went without. I was afraid of the side effects (as I always have been), so I just said no. And I probably would have done a lot better if I took it but I wasn’t willing to struggle with everything else for that. Don’t be afraid. It’s scary yes. But if you need it, take it. Sometimes you just need to give in for the sake of your exams. One of the things that plague me the absolute most when it comes to studying is the fact that I feel like a failure. I feel like there must be something wrong with me because I can’t sit still long enough to absorb anything and I always feel five steps behind the rest of my classmates. This semester there was someone in my class that made me feel that way on a daily basis and it was so hard and I got very upset but eventually I learnt to use my brain to fight back. I was not stupid. I shouldn’t allow someone to back me into a corner like that. If you are feeling that way or if you have someone who makes you feel like that, distance yourself from that firstly. Then constantly remind yourself that you just learn differently and that it does not mean that you are stupid. One thing that has helped me a lot is this blog. I succeed in writing here and that makes me feel better because I can say, “Okay. I don’t know how to come up with a cost based analysis. But that’s okay. My brain isn’t made for math. It’s made for creativity. So I’m not going to spiral into a meltdown because of it. I’m just going to do my best and be happy with that. It’s okay.” So find something that you are good at and go at it. Chase it. And remind yourself that no one can make you feel stupid unless you let them. Do you have any study tips to share? Tell me in the comments. P.S. I took pictures for this post but WordPress isn’t letting me upload them. If you can help, please help. This is so exciting! I’ve finally moved my blog from Blogger to WordPress! This has been something that I’ve been wanting to do for a very long time now and it’s so exciting that its finally happened! If you are here from my site when it was on Blogger, I want to say thank you for following me here. If you are new, I want to welcome you with everything I have. I’m Camillia and I’m run a lifestyle as well as a book blog. You will probably learn a lot more then that about me as we go on. I’m so excited to be here and I know that this move is going to inspire me to create even better content and to post more frequently. I’m still getting settled but I will be ready to go in about 2 weeks so look forward to that. Until then, you can follow my blog on WordPress directly or you can put your email down to get updates every time I post. Everything you need is to your right. Well, that’s all for now. Once again, I love you loads and thank you for following me on this journey. I don’t know what it is but lately, every book I’ve been reading has managed to strike a cord with me and has made me feel the need to tell you something about my life in the review. I don’t know. But it’s very cathartic to write so I’m going to keep doing that. 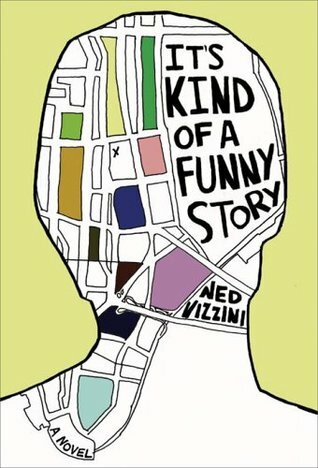 This book is about a kid with depression. Craig has a good family and a bright future but midway through, he got depressed. This book just made me feel understood. I don’t think I have ever talked about this in great detail but when I was 14, I had what I can only describe as depression. I was struggling a lot in school. I couldn’t keep up with my classmates academically because of my learning disabilities and that led to me believing what I was being fed at that point by my parents, tutors and teachers. That I was stupid and useless. I was also drowning socially. I had no friends and even the people I tried to hang out with bullied me mercilessly (I wasn’t very strong when I was younger. I let people step over me because I wanted friends). My relationship with my mom was at it’s worst. She was screaming at me nearly everyday. Life wasn’t very good for me at that point. I was so scared so I retreated into myself. I let my thoughts consume me and one day, I found myself in a very dark hole that I could not crawl out of. By this time, I was already crying myself to sleep, screaming into my pillows and starving myself because I was so afraid to face the school canteen by myself. I immersed myself in Jodi Picoult books and writing in my diary because it made the fact that I had no friends easier to bear. My mind, which had always been my safe place, had suddenly became a very scary prison. I would imagine killing myself. I even had a journal where I would plan it. I had everything I needed except the courage to do it. I would play everything out down to my funeral. At that time, I truly believed that no one would come to it. That my parents would be happier without me. That life would be better without me. It’s hard to convey to you just how real these thoughts were and how scared I was and anyone who has experienced this will say the same. Life was really really bad for me and I was drowning. Unfortunately, like many people, I was too scared to tell anyone. I never got formally diagnosed because my family refused to see my struggle. I left silent clues that I needed help. I silently projected my need and at one point even tried to self-harm (nothing too serious) but my parents refused to see them. They just refused to do it. So I struggled quietly. I self-diagnosed myself with depression with the online sources I had because I had no other choice. By the end of 2011, I was at my worst. I was being held back a grade because I had stopped taking my ADHD medication and I just couldn’t keep up anymore so I let everything slide. Life was bad. By the end of 2012, I had a scary diagnosis of an incurable disease (I still have it). But I was in remission after a year of hell and life was looking up despite that. I did well in my exams despite my constant absences because it was just a repeat of the previous year. I just needed that headstart and I got it by repeating. I had friends finally and I was feeling good. I learnt to readjust and I slowly became okay again. I still do get upset from time to time and I still can’t listen to Rascal Flatts without spiralling but I’m much better. I’m happy. Which is all I could ever want. I told you this story because I wanted you to understand how much this book and the struggle that Craig went through meant to me. I felt like I could really relate to Craig. I mean obviously since the author himself had depression and spent some time in a mental ward, he was in the best position to write a novel like this. I hate it when authors try to tackle issues that they are unfamiliar with and end up looking stupid and ignorant about the subject. It’s such a turn off so I’m so glad that Ned was able to write this. I think this book is one of them that helps people come to terms with what they are going through. It makes you feel not crazy for what you are feeling and I’m grateful for Ned for helping me along. The reason why this book lost it’s one star from me is because I felt like a lot of the conversations felt stilted and a bit forced. I also didn’t like that Noelle and Craig had insta-love going on. But at the heart of this book, the story was a good one and I recommend it to everyone. By the way, the author, Ned, sadly took his life in December 2013. Hello friends! Today is August the 3rd and it is also the start of Book-Tube-A-Thon 2015!! So if you didn’t know, Book-Tube-A-Thon is basically an annual readathon. It lasts a week till the 9th and it is huge in the book community. Every year, book tubers, bloggers, readers and book clubs will participate. They will pick 7 books based on the challenges and we will basically read as much as we can. Well that’s my TBR for this week. I’m super duper excited for it and I hope you are too if you are participating. Tell me what books are on your TBR for this exciting week!